You might be amused by this piece from the Independent’s health reporter Jeremy Laurance today. It’s about what a bad man I am for pointing out when science and health journalists get things wrong. Alongside the lengthy ad hominem – a matter of taste for you – there are a number of mistakes and, more than that, a worrying resistance to the idea that anyone should dare to engage in legitimate criticism. He also explains that health journalists simply can’t be expected to check facts. This worries me. I’ve dashed off some thoughts below, and offered the Independent a piece about the dangers of misleading science and health journalism, recurring problems, how it can be easily improved, etc. I’ve not heard back yet. 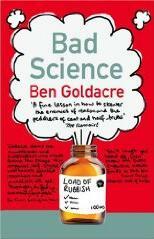 Is Ben Goldacre, the celebrated author of Bad Science and scourge of health journalists everywhere, losing it? So accustomed has he become to swinging his fists at the media when they get a science story wrong, I fear he may one day go nuclear and take out three rows of medical correspondents with a single lungful of biting sarcasm. He was at it again in Saturday’s Guardian, pistol-whipping his Guardian and Observer colleague, health correspondent Denis Campbell, over a report he wrote about fish oil and its supposed role in improving children’s intelligence. Campbell had reported claims made at a press conference that fish oil improved mental performance in children taking supplements. His crime, however, was to fail to check the claims against the academic paper on which they were based. That showed that the fish oil “enhanced the function of those brain regions that are involved in paying attention”, as revealed by a brain scanner. Not quite the same as “improving their performance”, as Goldacre rightly pointed out. Indeed the paper revealed that there had been no improvement in the children’s performance. Time, then, for Goldacre to deliver his customary knee-capping. He did so because Campbell declined to help him with his inquiries. Small wonder, given it is the second occasion the hapless Campbell has found himself in Goldacre’s sights. One doesn’t know whether to laugh or cry at The Guardian’s eagerness to wash its dirty linen in public. It is undeniably magnificent, but – in my view – no way to run a newspaper. I wonder at the psychiatrist’s bills. What does it tell us about health and science reporting? First, most disinterested observers think standards are pretty high (a report by the Department of Business last January said it was in “rude health”). Second, reporters are messengers – their job is to tell, as accurately as they can, what has been said, with the benefit of such insight as their experience allows them to bring, not to second guess whether what is said is right. But third, reporters are also under pressure. Newspaper sales are declining, staff have been cut, demands are increasing. 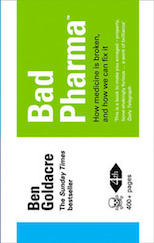 Goldacre is right to highlight the fact that there is too much “churnalism” – reporters turning out copy direct from press conferences and releases, without checking, to feed the insatiable news machine. This ought to be stopped. But no one, so far, has come up with a commercially realistic idea of how to stop it. In the meantime, while raging rightly at the scientific illiteracy of the media, he might reflect when naming young, eager reporters starting out on their careers that most don’t enjoy, as he does, the luxury of time, bloggers willing and able to do his spadework for him (one pointed out the flaws in Campbell’s report on The Guardian website five days before Goldacre’s column appeared) and membership of a profession (medicine) with guaranteed job security, a comfortable salary and gold-plated pension. If only. So there’s a lot of bluster there, which I’ll be grown up about. More importantly, as I’ve explained before, and as I’ve offered to write in the Independent today (not heard back from them yet, although I’m sure they’ll at least reply, surely) I think it’s worthwhile documenting the errors that medical and science journalists make for a number of reasons. Alongside pointing out an error – which in itself is a bit dull – this was a chance to talk about sample size, the importance of clear referencing for claims, and the appropriateness of making assertions about whether something works or not based on laboratory findings alone. But secondly, and perhaps more importantly, it matters when health coverage is misleading, because people really do believe what they read in the newspapers, and there is a wealth of research (which I’ve set out in various places online, and also recently in Lancet Oncology if you like that kind of thing) showing that people make really do make real decisions about their real health risk behaviours based on this information, so it needs to be reasonably accurate where possible. Anyway, I’ve offered the Independent a piece on these issues, which I hope they’ll take, because I think it’s more interesting than responding to Jeremy Laurance’s ad hominem attacks, and because I think these issues are important. I think it’s also worth saying that while I’m surprised I don’t get more angry articles like this – because journalists have paradoxically thin skins – there have been 3 now in the Independent, and they do always seem to be filled with wild inaccuracies. A whole column from the science correspondent Steve Connor was memorable for knowledgeably attacking the content of a meeting (“last night”) which in reality hadn’t even happened yet. Meanwhile the piece by Jeremy Laurance above isn’t far behind. Laurance says Denis Campbell was faithfully reporting the contents of a press conference by Prof McNamara, and says that health reporters can’t be expected to double check false claims made by academics in press conferences about their own work against the contents of their academic paper. Firstly, of course, I disagree: this is a manifesto for failure. A science or health journalist is not a dictation secretary, and they should be capable of reading and understanding an academic paper, especially if they’re claiming in their piece that the academic paper is their source, as Campbell did. It doesn’t take long, I’ve helped train people in it before, and I’ll happily do so again. But secondly, Jeremy Laurance rather rashly explains that Prof McNamara was responsible for making these false claims about his own research. I don’t know where Laurance gets this idea from, but it seemed very unlikely to me, so I asked Prof McNamara if it was true this morning in an email. He’s just got back to me, and Laurance is wrong on this too. There was a press conference, but Prof McNamara is absolutely clear that he didn’t claim his study had shown that omega-3 supplements improve performance, and he never has done so. He has kindly sent his slides from that presentation (and his correspondence with the Observer) which bear him out. Furthermore he doesn’t think there’s evidence that omega-3 supplements work at present, though he’s optimistic for the future, and I can find no evidence of him ever making claims that these pills improve performance, although such a claim has now been attributed to him by both Denis Campbell and, now, Jeremy Laurance. Meanwhile Laurance repeatedly talks about “fish oil” (the research showed that “fish oil ‘enhanced the function of those brain regions that are involved in paying attention’, as revealed by a brain scanner”and so on). As I explained, in the actual piece that Laurance is responding to, this wasn’t a study of fish oil, it was on omega-3 fatty acids derived from algae. Next up, we drift into Laurance’s slightly dreary ad hominem stuff (why are they so agitated by the idea that I went to medical school?) but it’s pertinent because he’s wrong again: he says that by “naming young, eager reporters starting out on their careers” such as Campbell I will put them off. But Denis Campbell started writing for the Observer in 1999, and in 1999 I was still a student. Meanwhile Denis had already at that time worked previously for the Herald, Scotland on Sunday, Time Out and the Irish Times. All I suggest is that when people write stuff in newspapers they could first take very basic steps to ensure that it is accurate. I don’t think that’s unreasonable, but more importantly, I hope the Independent will take a sensible piece on this, and on why repeated errors in medical coverage are non-trivial, as it’s an important issue. If you shout and get angry at reasoned criticism, instead of engaging with it constructively, you go down the same path as the homeopaths. Meanwhile if you are optimistic about the future of science journalism (I am, a little, from bloggers I know, the trainees I meet on various courses, and my mates who are sound science journalists) I invite you to feel the pleasure at this piece from some professional science journalists. Perhaps you will like this ringing endorsement of Laurance’s “good points well made”, from an editor at New Scientist, no less. For a corner of science journalists who feel it is impertinent and wrong that we dare to challenge their shortcomings, Jeremy Laurance is a champion. These are the ones to watch. (In the interests of fairness, I should say that equally, people like the mighty Ed Yong and Lawrence McGinty at ITV were rather less enthusiastic). Mmm, I’m generally a fan of the Independent, but one thing here is strikes me as being pretty graceless of them. I submitted the comment below to their website at lunchtime today. 5 hours later, 3 further comments that have appeared, all from within the past hour, and my comment hasn’t. I really do think that’s a bit weak, when it’s from the guy you’re writing about, but particularly when it’s pointing out flat errors in your piece. I’ve similarly had no reply from anyone at the Indy that I emailed to offer a piece, the comment editors, the features editors, or the editor’s office. I don’t have a very strong sense of entitlement, fair enough if they don’t want a piece, but altogether I think that’s not very stylish of the Indy, if you’re going to run a piece like that. I don’t think my comment was inappropriate, you can read it below. Edit 17:45: it appeared 30 mins after I badgered them on Twitter. here is bob ward’s earlier comment. there are other examples of this from bob. don’t know if it’s just me but i find this kind of thing really, really odd. Dr Robert McNamara, of the University of Cincinnati, who led the team of American researchers, said their findings could help pupils to study more effectively and potentially help to tackle both attention deficit hyperactivity disorder (ADHD) and depression. The study, reported in the American Journal of Clinical Nutrition, is important because a lack of DHA has been implicated in ADHD and other similar conditions, with poor maternal diet sometimes blamed for the child’s deficiency. ADHD affects an estimated 4%-8% of Britons and can seriously impair a child’s education because they have trouble concentrating and are often disruptive in class. A lack of DHA has also been associated with bipolar disorder and schizophrenia. The results, and fact that many people eat too little fish to get enough DHA through their diet, meant it could help all children to improve their learning, added McNamara. “The primary benefit is to treat ADHD and depression, but it could also help people with their memory, learning and attention,” he said. On the not publishing the comment bit, which does look poor, many blogging platforms use anti-spam filters that interpret comments with multiple (usually 3+) links embedded as likely spam. Your comment appears to meet this criterion. If you feel that humanities graduates are marginalised and patronised on this board, then welcome to my goddamn world. People with a respectable amount of scientific literacy feel this disparity in ALL media, and clearly this is because it impinges on the area they know. As you seem to suggest, if I was a history grad I might rail against much that was published on the basis of what I know, but at least if I was an English grad I would be hearing the news from like graduates, who have at least some respect for the subject because they love it. I haven’t heard it lately (perhaps he’s been told), but I’ve lost count of the number of times John Humphreys has induced splenic rage in me whenever he discusses a scientific research topic & trots out his habitual “that’s all very interesting, but what is it FOR?” I can’t imagine anyone on the Today progamme ever asking such a thing of, say, Martin Amis, Trevor Nunn or Calixto Beite (and I wouldn’t, either). Bloggers like Ben feel the deficit most acutely in their area of expertise, it’s true. And this leads us to wonder what the standard is like for those fields we don’t understand. Doubtless those with an expertise in history, economics or politics feel the same. But as I said once before, the language of scientific debate is so remote to those giving out news to us, there’s a special problem in that there are no grounds for a sensible discussion on how to improve things. I’m sorry you find it so tiresome to justify your ill-founded attack. You say that Denis Campbell wouldn’t tell you how he had got the idea that the trial was about attention – but the press release produced by the journal says clearly: “researchers from the University of Cincinatti report the findings of a study they conducted to evaluate the effects of DHA supplementation on attention in children”. Your complaint about the reference to fish oil pills is rather pedantic – the study was of DHA, which is a key compound found in fish oil, as the first line of the press release states. You also say that I accused Dr McNamara of misrepresenting his own work. No I didn’t. I simply repeated the quote from the story, which happens to be inconsistent with the content of his paper. Maybe he was misquoted, maybe he wasn’t – I don’t think you can assume that he was. Perhaps you could post his slides from the press conference so we can obtain an idea of what he said. But the biggest problem of all, Ben, is your assumption that the only legitimate source of information is a scientific paper itself. As you know, scientific papers are notwritten in a style that communciates clearly to a broad audience. Journalists have the job of identifying and conveying the most important information to their audiences, and they do that by working from a variety of sources, not by spending hours poring over a scientific paper. In this case, the paper and the press release were simply additional sources of information, the primary being Dr McNamara’s own words. So instead of always holding journalists single-handedly responsible for every inaccurate report, you might want to have a long hard look at the the role that researchers and journals play. Maybe that won’t be as easy and as fun as sticking the boot in on journalists, but at least it would have the virtue of being close to the truth. but there is simply no way that it claims that omega-3 supplements improve attention task performance, the central false claim made by denis campbell. i’ve asked prof mcnamara if i can post his slides, and his correspondence with the readers editor. at a quick audit, i believe i’ve written 6 times in 2010 about a journalist getting something wrong, and 13 times in the last 12 months. i don’t think it’s “putting the boot in”, nor do i think that represents a disproportionate amount of attention given the damage caused by irresponsible and misleading journalism. +1 to the ‘your comment triggered a filter’. Even if it was being manually reviewed in realtime, a delay of a few hours on publishing a long, complex critical comment is not an insult, it’s not even rude. It could, in fact, be evidence of taking time to check things and think them through, which is exactly what you are accusing them of not doing! Er no, that’s commonly known as re-writing history. The Obs shouldn’t just pull an article with no explanation; they should have printed/posted a correction/retraction. Let me explain what I mean by symbiotic in terms you might understand.. The Badscience column in the Cardigan criticising a column in the Observer is in my view the journalistic equivalent of a reacharound. Apologies if you find that crude, I thought it was pretty obvious what I meant by symbiotic.. hey ho. Interestingly, I don’t see a single blog post on here about a poor Guradian article, surely shome mistake? For me the solution is for all journalists (not just science journalists) to report clearly their sources, and be clear about what is supposition, inference etc (rather than intentionally fudging these things together and using weasel words to hide the weaknesses in the “story”). This does not directly imply more work for the journalists as they are free to cite poor references or state that they come from anonymous sources etc, so long as they are explicit about the source of any claims. People do use misleading or false citations in order to make their claims seem stronger but I think in general the pressure of the transparency in ones sources is likely to lead to a higher standard of journalism. End of discussion on “that” (non-)goal – no consideration of off-side or diving or even goal line technology ? “But third, reporters are also under pressure”. Is a Science correspondent under as much time pressure as a Sports Correspondent?